Cold and flu season can bring up a lot of questions if you find that you’re sick while on the HCG Diet. 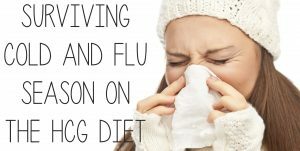 Here are a few HCG Diet tips for survival when you get a cold or the flu on the HCG Diet. The best advice is to just stay focused on sticking to the HCG Diet 100%. Whether you’re on the HCG Diet or not, when you’re sick, make sure you’re drinking tons of water. It will help flush out your system. Aim for at least 2 liters of water per day. If you need to take any medication, try and find options that are not gel caps or sugar-coated. Avoid cough syrups or cough drops because they are FULL of sugar. Mentally prepare yourself for stalling or slight gaining. When you’re sick, your body is focusing on making you better, so your weight loss may be affected. This usually happens due to water retention while sick, don't worry it should go away soon and you'll be back to losing weight fast! For a sore throat try hot water or tea flavored with stevia. The liquid stevia drops are available in several flavors that can help keep your taste buds happy and lower your chances of cheating. If you’re looking for comfort food try making some HCG-safe chicken broth (see recipe below). This recipe is adapted from the 101 Worry-Free HCG Diet Recipes cookbook. Combine ingredients in a pot and cook until chicken is done. Remove chicken and refrigerate or freeze to use at a later time (6 servings). Use broth as a base for soup or to sauté vegetables. You may also freeze Chicken Boullion Base for future cooking. If you are severely ill, go see your doctor! Remember to tell them you're on the HCG Diet. Have you been sick during a round on the HCG Diet? How did you survive?